Where do I begin? There is so much to tell about this one ride. Let’s catch up by saying that I hadn’t ridden this route since 2007 – I really missed it. I can’t lie; as intimidating as all the climbing is, as hard as the wind might blow, it really is a very pretty route, excellent country, stuff you just don’t get to see closer to home. Today, however, the ride would come in three dramatic parts. I’ve simply never had it this weird before, and leave it to this particular route to bring a challenge. About 25 or so, estimates are rough, hearty riders showed up for this route, and after arriving early and paying my entry fee, signing the waiver, and beginning my prep-work, I proceeded to drop my bike. MAN… I hate that. Leaned up against the side of the car, seemingly safe, I guess the wind got hold of it, and it rolled backwards and tipped over. ACK! I couldn’t reach it fast enough – but thankfully it was a “soft” fall, if there is such a thing. The pedal hit the pavement first, and the drivetrain rolled, slowing the fall. No damage, nothing bent, nothing weird came of it aside from a slight buff on the bar-end shifter. Still, it was a nice mental hiccup in a sport where mental preparedness is probably 85% of the game. I get there, unpack, I know at least the bike is ready… now, let’s drop it on the ground! Yeesh. So, after polishing off my pride, I finished packing on the three water bottles, my back pockets, and putting on the final touches. The first thing I noticed is that it was a tad chillier than when I’d left the house, and the wind was stronger; but the best part was the fact the wind was out of the correct direction! We are all forecast watchers, but today was difficult: even a couple posts ago when I was talking about prepping for this ride I had been talking about the 80’s for temperatures, and I wasn’t lying. But, in the 24 hours leading up to the ride start, the forecast had literally changed four more times. Now, we were looking at highs maybe in the 70’s, and maybe a cold front coming through. Just unpredictable. MY rando advice of the day: when packing the car to travel to a ride, bring everything you have and dress at the ride start: that’s the BEST advice I can give anyone. Don’t decide your clothing at the house. Pack it all. If you don’t need it, leave it in the car. This was one of those days. If it’s a 40 mile club ride, you can get away with forgetting a layer or a warmer… with potentially 15 hours of saddle time in the middle of no-where staring you in the face, take no chances. We all mounted up, and Bob took center stage to lay out the day’s expectations. Dogs, bad pavement and a proposed detour. A who’s-who of KC randonneuring was there: Jeff W., Ed, Steve “weatherman” G., Spencer, Jack, Dale B. “from Iowa-actually from Columbia” and friend, Danny “Clink” the Colonel, Alex, Steve B., “the tandem” – whose names I can never remember, but were on this ride in 2002 and have been doing them longer than that – a guy on a recumbent, and several others of note whose names also escape me at this writing. We rolled promptly at 6:00am, out into the streets of Liberty, and into the unknown. None of us – save for Steve the weatherman – really knew what was in store. The first thing I notice, right out of the gate, the hill on Clayview is easier. The weight-loss is going to help today, for sure. I highly recommend it. I am happy to be past the issues that somehow allowed me to pack on an additional 40 pounds in a little less than two years, and I place both feet forward by saying I will do whatever I can to make sure I live responsibly and not let my nutrition get out of hand again. I’ll remove all mystery from that variable of this ride: the hills were easier, fatigue was minimized, my back didn’t hurt afterwards, and my shorts weren’t cutting into me. Weight Watchers: it works, it’s worked for me twice now, and it’s worth it. (why twice? cuz, I'm an idiot.) Start, stick to it, you’ll get there. It can be the difference. While the day still had its challenges, it would have been worse with that extra weight on me, for certain. What comes next is more speed and fitness training, and that will come with time. We headed along the newly paved Glen Hedren outer road, which was actually a treat this time with wider lanes and no more pot-holes, and turned onto Lightburne, which would become Plattsburg Road. I talked it up with Jeff W., whom I hadn’t ridden with in a while, probably since last year, and we talked about the R-12, keeping the streak going, and the subject of weird midwest weather came up, like the late March snow that reset my 2nd R-12 run. Pretty soon, the hills were beginning to mount in succession, the hallmark of this route. It starts nasty, early, and never really lets up – but today, the strong tailwind was a blessing. Granted, a blessing that would eventually bite back, but we were going to enjoy it while we could. Jeff, Alex and Steve B. grouped up, and I held on as long as I could before logic smacked me in the face and reminded me that I had 170 miles to go. They are just plain FAST, and so I settled into my usual position. Eventually, however, I found myself first on the road! Jeff and company decided on a little detour at a critical turn, despite my hollering for their attention only a few clicks behind...and suddenly I was thrust into first place… which, make no mistake, means zero in the rando world. Still, it’s fun to say. I smiled to myself, and kept my pace up, curious to see how long I could stay off the front knowing full-well that Jeff and friends WOULD catch me once they turned around. I advanced up Plattsburg Road, past the familiar dips and dives, the newer houses, the fields and lakes, and shared a little conversation with a gent from Iowa that I think came down with Dale B., before he was advancing up the road while I continued finding my pace for the day. I managed to reel him up and stay ahead (big deal, I know) on State Rte “C”, and made it into Plattsburg really, really quickly – like on the order of an hour from the start time. I stopped off at the little corner C-store, nature break, and water refill, just in time to come outside and see the Iowa express come past. Oh well! Still no sign of Jeff and company. I made my way up to SR “Y” and took another turn north. The wind was just awesome, shoving me and my bike along at a wicked clip in the mid 20’s, sometimes poking into the 30’s, even on the flats as I motored along in top gear. This is where bicycling is the BEST, out alone on a good stretch of road, just letting it all hang out in the big chainring, and loving life – a small amount of sunshine (lot of clouds today) and a good wind at your back, and every reason to smile. I love this stuff. Behind me, after a couple more miles, I can hear the chatter of conversation – Jeff, Alex and Steve B are on my tail again, and we join up for the next 12 miles or so into Stewartsville, chatting it up, talking about Tejas and such, future plans. A good time. We hit the first control in style, out front of the group, feeling good. Cards are signed, bottles filled, and I buy up some PB crackers to help fuel the next leg – although Carboplex is the main item on my menu today. I still can’t quite let go of the “miracle powders” after all this time. I can never seem to find anything at the c-stores that fuels quite the same way, and is predictable: my only beef with the stuff, it makes my back pockets look ridiculous and makes me think about things like saddlebags and Camelbaks again, just for storage. Invisioning the latter on my back, I’m glad I snapped out of that delusion and just went with bottles. I carry three today, some nice insulated Camelbak “chilljacket” bottles: my only beef with THOSE is they’re only 21 oz., but three bottles still affords 63 oz. of water, and that’s plenty. My Zefal Magnum bottles hold 32 ounces each, and are a great solution if you only want to carry two bottles… BUT, I have had valve problems with those consistently: they end up leaking all over me and the bike while I drink, which raises the question of not only making a mess of myself, but how many of those extra ounces I end up losing from spillage, and the sports-drink crust that I end up chipping off the top tube after every ride with them. With the superior Camelbak Podium bottle valves, I’m only getting a drink when I want one – and the insulation is a huge bonus. While it didn’t get warm enough today for me to really test it, it’s notable that my drinks DID stay cool all day long, and that makes me more inclined to drink – because cool water tastes better. It's the best compromise I've found that allows me cold water on a hot day - something the insulative properties of the Camelbak backpack are good at - but without having something on my back. This will become more important on the 600K, for sure, where the longest stage between controls is 62 miles, and it should be hotter. Back to the 300K, just as we begin setting off from the Stewartsville control, the 2nd group pulls in, including Clink and Spencer. We bid hello, and then goodbye, and are off onto US-36’s ample shoulder, with Steve G. and Ed and a few others in tow. The best part of the ride was nearly upon us: State Route “J”, or, as I’ll call it now: the miracle run. As the fast trio of Jeff, Alex and Steve B. turned onto this brilliant stretch of pavement, and the Iowa express and I followed along, the speeds went right up, driven by an increased tailwind of easily 25-30 MPH. As a result, for at least five miles, I didn’t have a single occurrence when I looked down at my speed and saw anything less than 29 MPH. It was such good fun, at times sitting in the biggest gear I had on the bike and hammering along with no regards to how many miles lay ahead, or what the weather might do to us. We were flying. We were smiling. We were practically singing! The party continued for miles and miles more, until we finally had to stop at highway 6 after blasting full-bore through Amity, MO. Now, the real section of the ride was beginning. From here north, the hills would multiply in double and triple force, mile for mile, and the good pavement was officially behind us. Highway “H”. Ugh. Not the worst, and certainly not gravel, but definitely in need of some Mo-Dot love. Unfortunately, if the highway department repaved roads based on traffic volume, this one is going to be low on the post. I don’t know exactly how many cars we saw along the way here, but it was less than five for sure. That’s over probably 20 miles, easily. One of them was a heavy tractor, for example. More dogs on the road than cars, probably. At this point Jeff and the fast trio, including Iowa, were beginning to advance up the road. Not sure what it was that had me falling off the back, but it was real, and I slowed down a bit, for a little while. Not sure if it was a small “wall”, or a nutrition thing --- at this stage I had Sustained Energy in the fuel bottle, just to shake things up – and there may have been just enough simple sugar in the PB crackers or something to throw something off. Who knows – didn’t last, but it’s yet another nail in the coffin for specialized fuels that expect you to operate and ride inside a perfect bubble of nutrition. They’re good – but you have to be good, also, and I can’t carry that much powder: been here before. Carry on. Carboplex is cheap, mixes perfectly, you can flavor it with anything, mix it with anything, and have no worries. But, if I want to have a real Coke in Albany, I can. Anyways, I digress (shocked?). A five minute gap grows, and I’m alone on the roads and hills north of MO-6 once again. I do like it up here, but it can feel awfully lonely. Especially when mother nature comes out to play! Steve “the weatherman” called it, and I’m a believer. The national weather service eluded to it on Friday night, but it was vague and sketchy. I, personally, have never seen it play out so quickly. It was like walking through a door, to quote another randonneur that would recall the event later in the afternoon: I climbed to the top of yet another long grinder of a hill, and upon reaching the top I was greeted with 20+ MPH of north wind right in the face, and the temperature dropped 15 degrees almost instantly. BAM. There’s the front. I even looked over my shoulder to make sure I hadn’t missed a time portal or something. It was THAT quick. Along for the ride were sprinkles, barely enough to begin wetting the road. The jersey took on a good damp feeling, and I began walking that “jacket?”/”no jacket?” line for probably the next 15 miles. After turning east on highway “Z”, greeted by more hills and a crosswind, I elected to tough it out until I had to turn north again – but the temperature had dropped into the lower 50’s, where it had been approaching the mid 70’s for a while earlier. I relished in the warming effect the hills were having. Helping stave off boredom, and keep my mind off the constant climbing that highway “Z” offers, I began counting stuff. Pop cans, McD wrappers, cigarette boxes… an unusually large quantity of Mountain Dew bottles for some reason… interesting demographic: farmers like Mountain Dew?... as I rolled up the hills, I spotted something odd, though: Speedplay pedal?!? What the….? I stop, stoop, and plop it into my pocket… I’ll bet someone’s gonna miss this… and sure enough about a ½ mile later, at the top of a hill, two riders were stopped, looking around. Steve B. was about to one-leg it about 70 miles homeward, but I revealed my find. Steve waved me ahead and went about fixing his pedal, and I went about riding the rest of the hills eastward towards the intersection of Highway “A”, miles ahead. I thought perhaps that it was Jeff that had stopped to help Steve initially, but I would never find out. Even solo, Jeff is just too quick to catch yet, and if there is an advantage pound-for-pound between me and the four riders that were now ahead of me, I was the only one on steel, the only one running an antiquated and heavy Shimano 105 crankset, the only one running a generator front hub, the only one running heavy and bomb-proof Velocity rims, the only one running bar-ends, the only one running full fenders, the only one running a rear rack, the only one running a frame pump. Not to say this chase boiled down to equipment… bike for bike, they’re still faster riders, but I was feeling a little out of place trying to chase down a svelte carbon-fiber race bike with aerobars and Jeff W. as the engine. Fahgettaboutit! Of course, I just got done riding away from someone that broke a racing pedal… so, there are pros and cons both ways. I dropped my bike before the ride, and nothing happened to it. So there. Still, try as I might, there was no catching Jeff or anyone else at the front before Albany. With that knowledge, and the fact I knew my favorite rando intersection was coming up, I just geared down, enjoyed the hills and watched as more cold rain rolled in on top of me. Eventually, at the intersection, I stopped, snapped a few photos, swapped water bottles, finally decided the last turn north into the headwind and cold rain required the rain jacket, and took another nature break. About that time, Steve G. and someone else rolled up – I think it was Steve B., with the pedal finally fixed! After they rolled past, and I mounted back up, I kept my eye on things from about ½ mile back as the two Steves battled out the headwind and rain. Again, I wasn’t able to shove hard enough to catch up, but I was more in a conservation mode at this point. I was looking forward to turning around at Albany, and enjoying the 2nd tailwind of the day – which was just weird, because I’d never had the wind shift quite like this before. Hopefully, it’d stick. It was cold, it was raining, it was blowing… not unlike 2002, but with me on a much more appropriate bike and a far better jacket. In the next few miles, as I slowly but surely started to reel up one of the Steves, eventually being right on his wheel just short of the Casey’s in Albany, I was no longer envious of carbon, aero-bars, and super-minimalist set-ups. 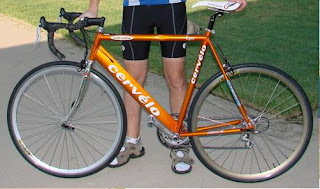 Knowing what I know from my experience on this route in 2002, not to keep repeating the same things over and over in this blog, but I’ll keep my steel bike with full fenders and generator set-up. It works… and as far as I can tell, it’s got a lot more to do with ME than what’s under me. I think more than anything, the “upgrades” I’m made to my own body have helped far more than any new parts ever would, but still, there are probably opportunities in the front crankset arena that I think back to the Knob Noster 200K for, namely a compact crankset: Yes, back on Highway “J” was WAS in 53x12 for a short time, but certainly not at a high RPM. That’s the only time in recent memory I can remember being in that gear…or 53x13 for that matter… and needing to be. I think I’m more in need of extra RPMs on the steeper hills, more than I’m in need of wicked top-end power during these rare super-tailwind rides. 50x12… that’s plenty big. 34x25, though, provides more spinning potential in the hills than 39x25 does. It’s almost like having a 28 tooth cog out back, without changing cassettes… and considering my rear derailleur won’t wrap up that big of a cog anyways. Dale B. and I exchanged thoughts on that note, climbing a hill later in the day, while I was in 39x23, pumping, and he was in 36x25, spinning. I mean, if you’re going to be doing 7 MPH on a steep grinder ANYways, why kill your knees with 45 RPM? I don’t want a triple… if I’m going to change parts, it needs to be an upgrade. Not a RACER upgrade, but a sensible compact crankset with the updated bottom bracket perhaps. A little increase in versatility, and a little weight savings. That seems reasonable to me. Honestly, not that appearance counts for much on a bike with full fenders, but from the side sometimes that 105 crankset looks, well, cheap. Which, on the closeout table, it was. We’ll see. I have a birthday coming, and a trip to a swap meet that might raise some capital. 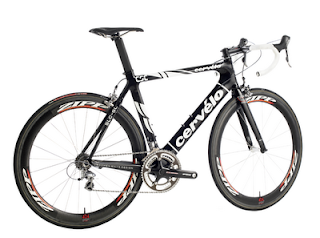 Certainly not a frivolous upgrade opportunity – while it works fine, the rest of the bike is higher-end equipment, and the crankset is the one thing that’s left to advance. Might as well, right? He,he. In Albany, finally shielded from the rain and wind behind the Casey’s store, I began to feast on a banana, a vitamin shooter, and some of the coveted Casey’s potato cheese bites, some leftover PB crackers, and a little shot of Hammer Gel to round things out. Bottles refilled, a little stretching, and second-guessing about whether or not to keep the jacket on, and we were off again. We talked about the bear of a dog that was waiting for us in Evona, just up the road. I think, honestly, next time, I’m going to ride on the other side of the highway, just to see if it makes a difference. After stories of getting chased, getting nearly-bitten, and myself getting chased halfway up the subsequent uphill – it’s amazing, after nearly 90 miles of slog, the last 16 into a cold headwind and rain, that a large snarling dog can still squeeze a wicked sprint out of tired legs. On the return, the beast seems to not be terribly interested at all, as he just sits by the porch of the house he’d come from initially. On the way down, however, perhaps we’re on “his” side of the road… and that’s what launches the property protection instinct? Who knows. I, for one, am a big fan of leash laws. Last time I checked, the surface of the Missouri state highway is NOT a home-owners property that a large dog would be employed to protect. If I cross onto your grass, by all means, get me… until that happens, get off my shoe!!! UGH! There was little time to discuss dogs and sprints, however, as upon leaving Evona there is a long steady climb that takes you up onto a plateau, and it slows and breaks up the group a little bit as we roll along. From this point, it’s clear who the headwind and cold section of the final trip up to Albany affected, and who it didn’t. Jeff and the faster two guys are, well, fast – consistently. They are up the road, up the hill, and start making time and distance from us towards Stewartsville. Spencer, Clink, Dale B., myself and a couple others, with Steve G. and Ed along for the ride, all start working along, enjoying the new tailwind that once we cursed only an hour before. The hills on highway Z came back, and we all safely stayed in our own little zones, climbing and descending and trying not to run into each other, all while enjoying the scenery and dodging rain drops here and there as the weather still tried to figure itself out behind the front. What rolled through the rest of Johnson County on Monday is pretty much what we experienced on Saturday up north, about 100 miles or more away. (seems weird saying that, especially since we were on bikes.) I envisioned warm southerly breezes on my back porch, and here I was way up north in the chilly air. Weird. Usually, on these long rides, the weather isn’t all that different back home – today, I might as well have been in Minnesota. Eventually, after the long, steep grinders of highway Z were past us, and the choppy pavement of highway H was behind us, all fueled by a chilly tailwind and sporadic raindrops, we were back on highway J on the other side of Missouri-6. Whew… this, again from the 2002 ride, is where I always relax a little. I’m closer to civilization (sorta), and beyond the part of the ride that gave me so much pain way back when. Not that I wasn’t enjoying the ride, but now, I was REALLY enjoying the ride. There is something special, reaching that halfway point, and then reaching the 2/3rd’s done point. On a ride like this, suddenly you have this subconscious feeling that you’re definitely gonna finish, and the worst is over. And, there’s no irony there, intended or implied… this, really, was turning out to be a great ride. I was mildly nervous about the prospect of riding an additional 100 kilometers above and beyond what I’d been used to for the previous 13 months or so, but it turns out between all those 200Ks and all the weight loss, I was having an exceptional time of things. The bike was performing great, my three bottle system was working fine and I was well hydrated as a result, and for once I was actually carrying too MUCH food. I need to work on my perception of caloric needs on the next big ride, actually: I carried enough Carboplex to suit my effort, but I still loaded up on food at the controls. I’m thinking possibly a one-or-the-other approach might be in order – but the good thing is my stomach meter and such kept me from over eating: the extra food just stayed in my bock pockets, so I just hung onto it and used it to prevent purchasing at the next control, and so-on. It never got terribly hot, but cramping was never an issue, either, which is a very good thing. The tailwind helped propel us along on Highway J, where I played with positions and tried to bridge up between the remains of our group from time to time, testing the legs and playing in the tailwind. Saw a lot of interesting scenery, bounced out of a pothole on a bridge in Amity – oops – and rode alongside some running and prancing baby horses (er, foals?) as we got closer to US-36 again. I really enjoy this stretch of road! Right about reaching US-36, however, I had a sneaking feeling the honey-moon with the weather was going to come to a crashing halt. The clouds were a little thicker, a little darker, and there was that smell of warm rain on warm pavement. Sweet, summer rain… Hmmmm. A sign of heating, which increases storm intensity, noted. Plus, I'm not sure what it is about timing: as soon as we're on the shoulder of US-36 headed west - where the shoulder is NARROWER - the heaviest rain of the day so-far started up. Nice. I manage to catch up to Dale B. and Clink, and then Clink pulls off to help his friend change a flat - Dale and I continue on to the control. Eventually, we're all together again at Stewartsville, going thru the usual brevet routine once again. This one is a slightly longer break, and people sit down on the pavement for a spell, eating food and staring off into space. A good time to do it, really: this is the last control of the day - this ride is practically in the bag, with about 42 miles to ride is all. Eventually, though, resting TOO long, and the impending storms that are now echoed in the comments of passersby and store-keeps alike enter our thoughts. There is talk of St. Joseph being under the gun, just to our west, and the front beginning to fire off storms, instead of gentle rainshowers. Time to roll. We group up, and hit the road. I am gapped a little, after deciding at the last minute that rinsing the dead sea off my face might be a good idea - but I like the notion of playing a little catch-up back out on the roads. I stretch the legs, and soft-hammer (as much as the 140+ miles in my legs will let me) back up to the group of 6 or 7 riders that have all lumped together. We enjoy highway Y for a while, occasional sprinkles, and a continued tailwind. This is pretty rare, the double tailwind ride, and nobody is really talking about it too loudly - as if we knew what was coming. I think we all did: it was only a matter of time before we'd cross that mystical, invisible border that we'd crossed on the way north. Something was going to change - and as we rolled past the lonely intersection of highway "NN" and "Y", headed south, there it was... again, just like walking through a door... there was a tailwind, and the suddenly a headwind... a STRONG headwind. Whoa... the hidden blessing was the temperatures on the other side were markedly warmer and more humid, and any notions of jackets and warmers were now unfounded. In atypical randonneur fashion, we actually made some sad attempts at organizing a paceline and working towards a common goal in the wind. Laughable. We're all soloists at heart - I tihnk it's an unwritten rule somewhere. Try as we might, it never stuck - but it DID help. Clink would pull, then Jack, then a few of us at the back would start to feel guilty, so we moved up the left and pulled for a few miles, Spencer and I pulled the train side by side for a while to block the most wind and hopefully set up the double paceline, and then someone else came up, and I tried to start the rotation... but to no avail. Still, the best part of all this shuffling around - we totally forgot about the miles, and how strong the wind really was. Before long, we were poking back into Plattsburg, and turning left onto MO-116. Wow... just like that, 22 miles to go, roughly. Nice! There's a little c-store here at the corner of 116 and route "C", and it's a good enough reason to regroup before the final push back south. But, to our north and west, however, there was a dark force looking for a drafting partner on the road. Steely grey, with a tinge of green, and a low rumble, he was coming up behind all of us. Steve G and Ed rolled in, and the weatherman layed it out for us. We had to move. I turned on my phone - battery saving move by having it "off" inside the saddlebag - and as the network kicked in, I was delivered a handful of weather-related text messages one after another. Flood warnings, flood watches, a tornado watch, and severe thunderstorm warnings. All of them close-by. To give you an idea, for those that don't live here, there is a creepy pattern every spring that seems to repeat. Call it wind-field dynamics, or the fabled "Tonganoxie split", there is a phenomena that seems to push the worst of the weather north of where the bulk of the Kansas City population resides. Down in my neck of the woods, we always get our TV programs interrupted (to my delight, most of the time) with news of nasty weather... but usually, talk it up as they might, it doesn't hit Olathe, Overland Park, Lenexa... looking at any weather website and watching the radar loops confirms it, and the newscasters always spell it out: Kearney, Chilicothe, St Joseph, Platte City, Camden Point, Plattsburg, Maysville... and every time they do, I shake my head knowing that only a few weeks (sometimes only days) prior, or following, that I was up there riding a bicycle. Today, I actually was... roll the dice enough, and the numbers will come up. It was indeed time to move out. Amid fumblings with gloves and helmets, and smelling that smell in the air, the taste of energy just hanging in the warm thickness, I knew it was real. But, fighting nature is a silly game, a losing game. All we were going to be able to do was our best, after 160 miles complete, and some serious hills and a big plateau with nothing to block the growing headwinds lying ahead of us. The first bunch headed out, and I found myself detached again, like in Stewartsville - but this time it was accompanied by a request to stay together from a couple riders that had rolled in later. This is another rando impossibility, at least from my seat. Try as I might, I was either going too slowly, or not slow enough. Highway C stretched out before me, and the climbing came, and I found myself alone ultimately, my attempts to provide a draft not working or sticking. Eventually I had to just let it go, knowing that we were all within a half-mile of each other, and that was as good as "sticking together" was going to get. We each had to fight our own individual battle against the winds, trying to inch away from the dark competitor that was lurking up the road behind us. I peered over my right shoulder at one point, and it was an awesome sight - forboding, seething... he was coming. A quick regroup, and I pedal on up again, slowly chipping away at the miles of highway C that never seem to end. There's the water tower... then Route J... then that house with the black truck.... then Route "CC".... finally! Plattsburg Road again... relative safety. Traffic on Highway C can be a shore, but today it really wasn't too bad. Still, I was glad to be back on the little roads. Despite the shifting winds that were balancing out the effort of the day nad keeping speed at bay, it was still not even 5:00pm - and while I knew a sub-12 hour 300K was not going to be in the cards on this route, on this day, it was satisfying to hit Plattsburg Road at such an early hour; normally one of my interim goals for this ride is to make it back to Plattsburg road before the sun goes down, and today I had HOURS to spare. That was worth something! Reaching Albany when we did was something special, lemme tell you - a pretty good 90 miles. If the wind hadn't shifted, we might have even pulled off the elusive "sit on the curb, because you got here too fast" manuever... excellent stuff... but now, with the hills and wind taking their toll, the numbers were certainly slipping. Again, for this type of event, those numbers really aren't important. You know what they call the last guy to cross the line at a brevet? A FINISHER. There are no places... and I think that's why I love this particular niche of cycling. With the darkness approaching, trying to catch my wheel, it was time to start trying to dig a little deeper. This part of the ride is usually limp-mode - I slow down and relax the last 15 miles more often than not on this route - but today, the front was pressing the issue. A flash of lightning, and the birds are starting to act a little weird. Not good signs. The raindrops are starting again, and they are fatter, signs of updrafts. The air was thick with energy, and the hills were not making it easy. I finally exhausted the last of my water from bottle number one - and since bottle number two was mostly fuel, I had to stop to swap bottles again (bottle number three rests on the rear rack, liek a rack trunk would: but mine only carries water. Yeah, it requires stopping to safely retrieve - but so would a third bottle cage mounted low. It works. About then, Steve G. catches up and checks in -- and Ed is out of sight, but he knows the roads well. I mount up, and start to make my way back south again - more lightning dances across the skies... yeesh, this is a little creepy. Move it.... don't think, just pedal and get back to the car before anything happens! Feeling good, hydrated, and uncharacteristically peppy for so late in this ride, the last ten miles went really well. The hills here ALWAYS top off this ride with "style" - it's usually a struggle, these last few climbs... at least one good one per mile, up and down, up and down -- it wears on you with 175 miles in the pipes... but today, I was feeling motivated, stronger... I was finishing this beast of a ride strong... that's new for me! Finally, with the winds only getting stronger, the rain becoming more steady, and the lightning more frequent, I crossed under I-35 - the last big marker that essentially says "welcome back to Liberty." Only a few miles to the finish -- thank goodness they repaved that outer road! The last trip back up those last few long hills on the outer road were over with, and I was back in residential side streets, winding my way back to Perkins, down the long speed-fest of a hill on Clayview, and to a clear road to cross over to the parking lot, still bustling with activity from Clink, Spencer, and all the other 6 or 7 riders that had made it in only a few minutes prior. I made good time, and just in time for the real rain to begin. Finding out later that someone had spotted a funnel cloud only a few miles northwest put the final "whew" on the whole event. And the creepy thing was there were still riders out there, hours behind us, that were going to have to make it back in the middle of all that. I felt fortunate for the speed I managed - and I noticed that Bob's (the RBAs) car was missing.. a sign that maybe earlier in the day he'd decided to play it safer, maybe drive out and look for riders? I didn't remember seeing him out on the road, or at the controls - but he had suited up to ride that morning. Something tells me everyone made it back in one piece, probably with a great story. But, man... we got lucky. Sort of anticlimatic in spirit, as I packed the car and began to head back south I was now really able to give that storm front a run for its money... and it wasn't until hours later, overnight, that anything happened in Olathe, weather-wise. As usual... most of it stayed to the north, up where the mystery is, up on those lonely roads. Road notes: that compact crank might be a good idea, but it's certainly not a must-have. Three water bottles are perfect.. drink without worrying about conserving, and I stay hydrated. The insulation should prove invaluable, as the temps rise in the coming months. It's not as clean a set-up as a third water bottle cage mounted to the frame - but it solved the back-pocket question. When the rain stopped for a while, I lashed my rain jacket to the handlebars with a ankle-band - and it worked really well. It kept it at hand, for the rapid weather swings, but it was out of the way, and not stuffed madly into a jersey pocket. I've got a couple more of those ankle bands at home, and I'll take those along to create an open-air handlebar "bag" for spare layers in case pocket storage runs low. At this point, I can't see investing in another saddlebag - yes they hold a ton, but I don't need to be carrying as much stuff as I had with me, another hard habit to break. I like being prepared, but some of the layers I brought along I never ended up needing, which effectively just was stuff that was long for the ride. It's hard to predict everything, but I have become more adaptable to changing weather over time, so it's time to leave some of it behind - or in a dropbag at a control if I end up not needing it. An ACTUAL handlebar bag might be nice - but it should be smaller than the Carradice SuperC that I'd bought in the past -- that thing was massive, too large, really. Something small and soft-sided, maybe, maybe. Another option that I spotted on Spencer this weekend is a wind-vest with POCKETS. SIx pockets instead of three might work... Bike fit is good - no issues, no lingering pain. All I know is, I'm ready to rest up for the 400K, which is less than two weeks out. I'm pretty beat, but exceedingly pleased. The last time I rode a 200k, I was heavier and it took about 13 hours and change. Today, after some focused training and weight loss, I rode a 300k in 13 hours and 3 minutes. Effectively, if I was racing the February 6th version of me in a 13 hour time-trial, today's version of me would have been 62 miles or more ahead at the end. I feel pumped, like I can't hardly describe. That's total time, also. Rolling time today for the 187 miles was 11 hrs, 10 mins. I will never let my weight slip again. I'm tired from the effort, but not totally destroyed like the end of nearly every R-12 ride last year. Still work to be done: the fastest bunch were probably an hour ahead of me, and the next fastest pack was only maybe 20 minutes ahead.... but, I can't complain about that. That's not what rando is all about: I improved MY time, and that does count. Considering the first finisher today was a Tejas finisher and third in his age group (? ), I know what I need to do. With shifting winds, wild temperature swings, warm rain, cold rain, and an unofficial 17,000 feet of climbing, I am tremendously pleased with my day! More to come.... time to sleep. It's my favorite route. It's a challenge, no matter how you slice it. Finishing it always brings a big smile to my face. It's the KCUC 300K coming up in two weeks! Visit kcbrevets.blogspot.com for more details - pre-registration is encouraged, but there is day-of registration as well. Arrive early, please -- we roll at 6:00AM. Lights required, for sure -- at the very least the ride starts before sunrise, and it's a challenge to finish before sundown. Quiet roads, scenic vistas, and the satisfaction of a long ride. It's not often in these tough economic times that I get to eat out at a reallllllly nice restaurant - and last night was one of those times. Granted, I still got to eat there - but the wife and I were graciously hosted on someone elses ticket. For a few moments we got to live as if there was no care or concern, and we performed well. A bottle of red, bottle of white, good friends, good breads, appetizers, and FAN-tastic food. ...And, then, the guilt set in. Having made good progress towards my goal of dropping the excuses (aka, weight) this year, I didn't really want to give myself too much of a set-back. I suppose once every so often, it's okay to splurge -- its when one makes it a regular event that the pounds sneak back on, so I suppose all is not lost.... but I still arrived at home, relaxed for a few moments, bid farewell to the babysitter, and then said to the wife "I'm gonna have to ride a bit extra to burn this one off!".... and then, I repeated it in my head a few times... Hmmm.... it's still in the 60's outside, and the weather is going to close in... why not??? With that, I saddled up and took to the night. This is the common theme this year, so far. I suppose I will indeed take what I can get, my schedule being what it is, but I would really like to ride under a warm sunshine one of these weekends! Yeesh.... been too long for that. Until then, for the 2nd time in as many weeks, I've taken to the streets after dark for some miles. Not TOO many this time, only about 25 or so - barely enough to get the system warmed up - but still, it was nice. The rainshowers of the evening had passed on to the east, and the moon was high, stars bright, and winds lighter at 11pm when I left the driveway. It's a nice thing having the roads to one-self, at such a late hour. Yeah, I'd like some heat, some sunshine... all in good time... there is still something magical about the night ride - especially the LATE night ride. On no particular course, I rode south, then east, then south again, climbing the big hill on Antioch towards 191st street -- the monster climb that begins the Border Patrol 217km permanent. This was the first time since.... gosh, June? July?, since I'd climbed this hill, and MAN what a difference. That old snap is back in the legs, and I FINALLY was able to climb it without using up all my gears. It's coming back... save your money, kids, don't worry about those expensive feather-weight bike parts... if you have a few pounds to lose, do it! (Easier said than done, believe me - I understand). I smiled to myself upon reaching the "top" of the hill (since it never really stops until you reach 191st street anyways) and thought about all the hills up north of Liberty, MO., that I'll be climbing at the end of this month. April 25th looms...that will, pending the weather, be my "day in the sun" - the first in what seems like an eternity. With the weather closed in again today, as I type this, it's hard to imagine winter ever really ending. Leaving the shelter of the trees and getting lifted onto the other side of the ridge, the southwest wind was still fully there - shifting more to the west, it seemed, as the night wore on. I skirted Spring Hill High School and enjoyed a tailwind finally after doing battle on the deceptive rollers on 199th street. As I made my way, I defintely noticed that the temperature was beginning to drop, and in the final few miles the wind had shifted to the north. Good timing... I hit the garage, polished off the rest of my water, and hit the sack. They say life is about balance, and this was a good day --- an excellent, lavish meal - and a good solid bike ride to help digest things. I'm pretty sure I'm still in the hole, calorically, but if nothing else today, I really shook up the metabolism. I'm aiming for 165 lbs for the 300km ride coming up April 25th.... game on! With somewhere between 12,000 and 17,000 ft of climbing, that's a route where the pounds will really make the difference.